Article Update: 27 Sept 2008 Added a couple of resources. 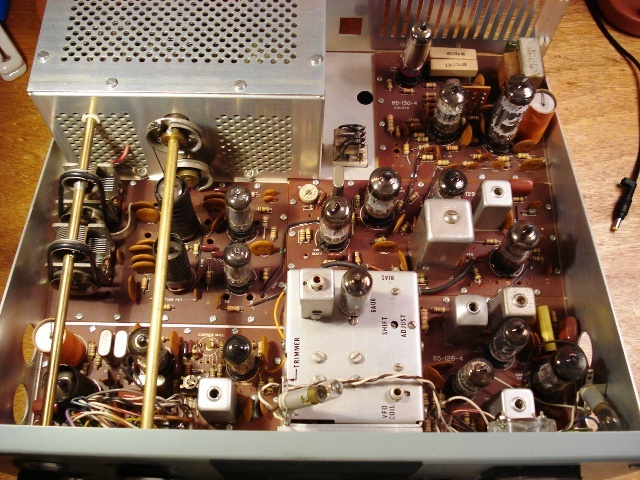 There is an excellent web site by k5bcq on Heathkit repair of many models. 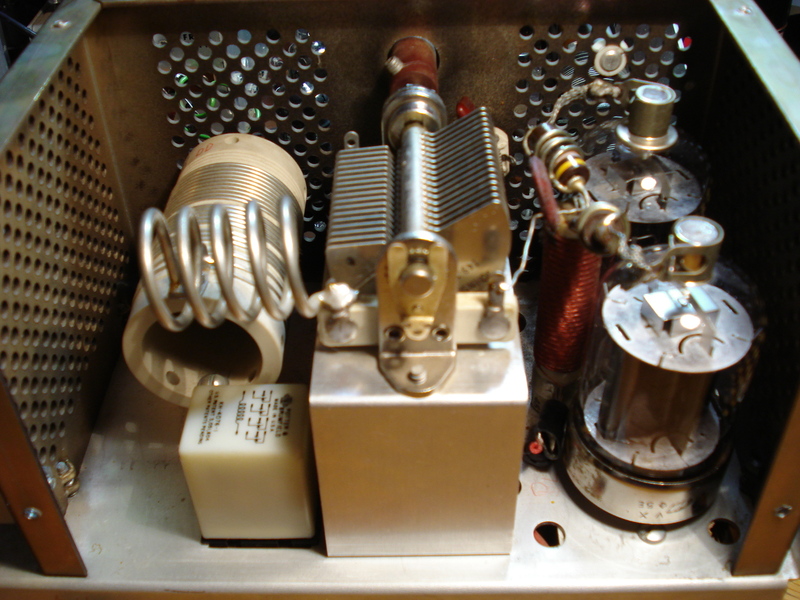 We also found an interesting article “Hot Water for the K2” by k1rfd on how to leverage the final power anp of the Heeathkit HW-101 (or really any of the SB/HW tube Heathkits) as the final drive for the Elecraft K2 – or any exciter source. References to both of these articles can be found in the Resouces section near the end of this article. We made this pitch before and we will make it again. At the time of this writing a new mid-class HF radio costs about $1,000 to $1,500. So for that amount of money you would purchase 5 older vintage HF radios and have 5 times the fun. So why not go “Vintage”. A pre-condition for “going vintage” is to have some appreciation for the history of Ham Radio. If you don’t know anything about the history of Ham Radio maybe this is your chance to learn something about this history of your hobby – or “service” if you prefer that way of speaking. If you always wanted to know “what’s in the black box” of Radio then this is an opportunity to find out. If you find yourself as an “appliance operator” – spinning knobs, pressing buttons, and flipping switches into some back box of unknown technology then “going Vintage” can open that box for you and show you what is inside the black box and what makes a Ham Radio transmitter really work at the electronics level. If you want to “go vintage” and incur the collateral damage of learning about the history of radio and what’s in the black box of magical parts then Heatkit radios might be a good way to start. Of course you should know that Heath is no longer in business and you can no longer buy an unbuilt kit from from the manufacturer. But you can buy a built Heathkit off of eBay. If you look at ebayatthe right time you will find unbuilt Heathkits – these sell for thousands of dollars. 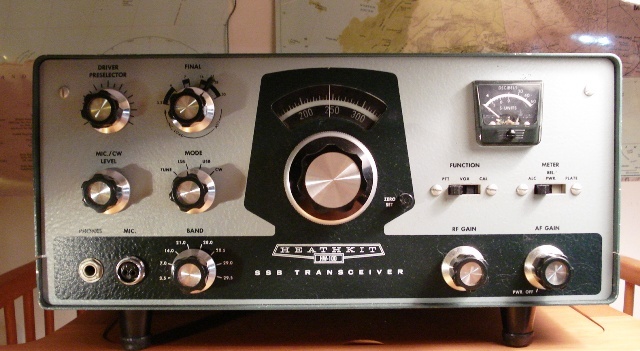 An unbuilt Heathkit HW-101 transceiver can go for between $1,000 and $2,000. 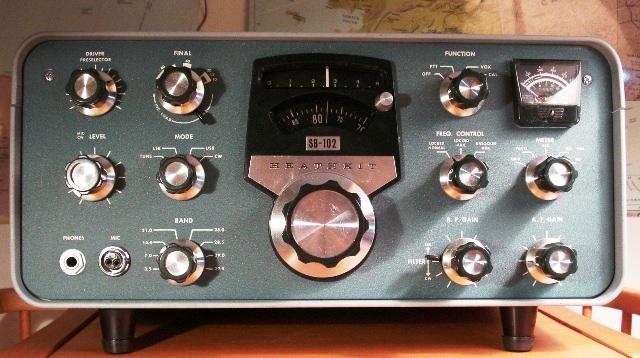 A built heathkit of the popular Heathkit SB-101 or SB-102 can be had for between $150 and $300. Some of the other models – the Heathkit HW-100 or HW-101 can be had for between $100 and $250. 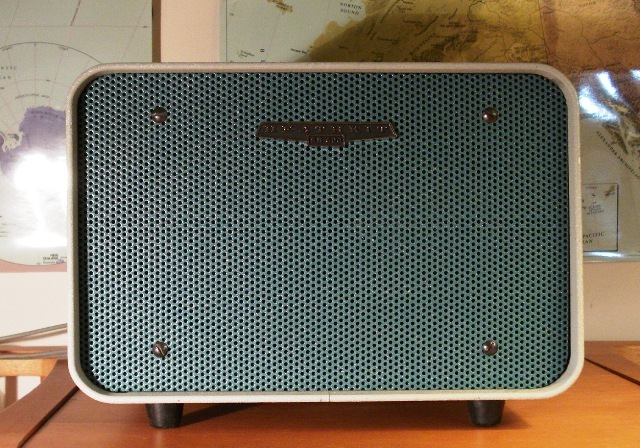 Prices of Heathkits on ebay can vary widely as does the condition of these radios. We prefer to buy radios on eBay rather than at a hamfest. The reason for this is that sellers on ebay have a reputation to protect via eBay feedback left by each buyer that deals with that seller. Sellers have an incentive to protect their reputation – for future sales and their reputation on eBay. Sellers at hamfests have no such incentive. Sellers on eBay selling Heatkits are sometimes (most of the time) not hams themselves. So you need to evaluate if these sellers know what they are talking about when they describe the radio. Also, a picture is worth 1,000 words. Make sure they show you the inside of the radio. You want to check for grease, dirt, broken drive belts, missing tubes, and the spider webs. The most popular Heathkit models on eBay are the SB series and the HW series. People refer to the HW models as the “Hot Water” models. Over time, we snagged 4 Heatkits off of ebay. In our collection we have a SB-101, SB-102, HW-100, and HW-101. We bought these after relentless questioning of the seller and we paid a premium price for all of them. All of our Heatkits radios are in excellent shape and transmit and receive on all bands. To get a fully working station you need more than the radio. 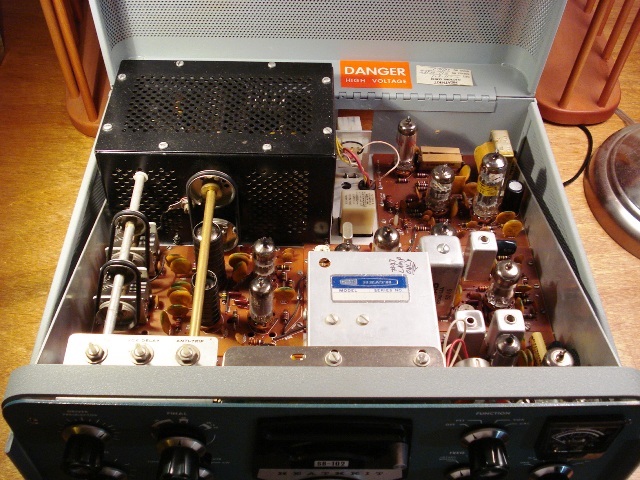 The heathkit models above all require a speaker and power supply. All of the radios above match up with the HP-23 power supply and SB-600 speaker. So at minumum you really need 4 things to get a station up and running. You need a radio, a power supply, a speaker, andamicrophone. If you are just starting out you might find on ebay a “complete station” – that would include all these components. 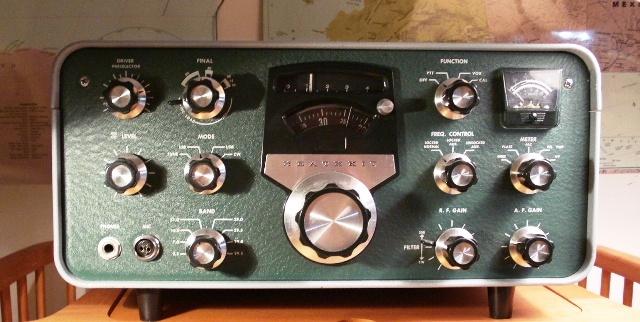 We were lucky, the first Heathkit we bought on ebay was a HW-100 complete station. The seller was a lady who was selling it on ebay for an elderly ham. After some relentless questioning we bought the complete station for $175. Upon receiving the radio it was clear that this ham treated this radio with TLC and it was in excellent functional and cosmetic shape – we were lucky. You might not be so lucky. You need to ensure that you do your due diligence before you buy a radio – or anything – from a seller on ebay. Described above is the minimum you will need. Heath also had station accessories that you could add such as a monitor, remote VFO, meters, and other components. The SB-102 was the last and the best of the SB line. It was the last vacuum tube rig that Heatkit produced. The SB-102 was introduced in 1970. So a radio you pick up today on ebay may be about 30 years old. The follow on to the SB-102 was the SB-104. The SB-104 was a solid state rig. So, if you have the SB-102 you have the end of an era for the SB series. You also have a radio that glows in the dark with 20 tubes. One component that changed the most across the SB and HW line was the VFO. Or, in Heathkit terms, the LMO – Linear Master Oscillator. The difference between the SB-101 and SB-102 was that the SB-102 used a FET in the LMO whereas the SB-101 used a tube. LMO oscillator stability was an ongoing area of improvement for Heathkit. What’s inside the black (or green for Heathkit) box. These were radio’s that you built by hand and that you could work on. These radios were “simple” in radio design so that if you wanted to learn something about how radio works then this was your opportunity. You only need some basic equipment such as an oscilloscope and VOM. The SB-101 and SB-102 have a cover the flips up from the front for easy access. The HW-100 and HW-102 are secured with a ton of machine screws. On those radios you have to remove the screws and slide out the chassis from the cabinet. Not at all as easy as the SB line. Here is the inside of the SB-102. This was nearly spotless inside and it was well cared for . We paid $300 for this radio of ebay from a ham. The black box in the back is the finals unit. It contains 2×6146 finals and the pi tuning network. This is what is inside that black box. Its the same for all the SB and HW radios we discuss in this posting. The Heathkit manuals were primarily construction manuals. It told you how to build or “manufacture” the radio. During the build process they made little to no effort to teach or explain any radio theory to you. Near the back of the assembly manual they always had a section called “Circuit Description”. This is where you would go if you wanted to know how the radio actually works from a radio/electronics perspective. We think that Heath missed a huge opportunity in the education market. They had a great kit which could have been used to as a practical building project with the focus being on education on radio theory and design. You should note that all the SB and HW tube rigs are essentially the same. If you can understand how one works – they are all just variations on the same theme. The assembly manual will make an attempt to explain how this radio works in the Circuit Description section.. Lets see if we can make sense of this for the Heathkit transmitter section. Let’s see if we can understand, in rough terms, how this radio develops a RF SSB signal. The first step is to understand each of these major blocks of functionality. Then, we can string all these components together to show how it develops an RF SSB signal. Magjor blocks of transmitter functionality include the following. Carrier Oscillator. This is 2 x Colpitts oscillators which are switched from the front panel – this is the LSB / USB mode switch. You can choose USB or LSB. Switched to USB the carrier oscilator generates 3396.4 khz. Switched to USB the RF signal generated by the Colpitts oscillator is 3393.6 khz. Each oscillator has it’s own crystal. Balanced Modulator. A balanced modulator is essentially a mixer that takes a couple of frequencies and mixes them in a non-linear fashion. The feature of a balanced modulator is that it it produces only the sum and difference frequencies. You might want to read our article on the Superheterodyne process to understand the non linear mixing process and what products are produced in this process. Isolation amplifier. This will link the output of the balanced modulator to the next stage which will be a crystal filter. The isolation amplifier does impedance matching and takes input from the ALC to adjust the gain. For simplicity we’ll ignore the ALC – it is not relevant to the development of the RF signal. Crystal Filter. This has a center frequency of 3395 kHz and a 2.1 khz bandwidth. Does 2.1 khz sound familiar – that is a typical SSB bandwidth. Note the center frequency. The filter in LSB mode will only pass sum frequencies of carrier + audio (3393.6 + audio 350-2450khz). The filter in USB mode will only pass the difference frequencies 3396.5 ninus the audio frequencies 350-2450khz. Sidebands will be inverted in the 2nd mixer later. Out of the filter you will get one of the sidebands. Still, no matter what the final operating frequency, these frequencies are used for all bands. IF Amplifier. Gives the signal a boost and passes it on. No magic here. LMO. Now here is something that is critical. The Linear Master Oscillator. The LMO is the dial that you spin to get different frequencies. But note that the LMO on all the Heathkits we are discussing generate a signal 5.105 Mhz to 5.4 Mhz. The LMO will provide one frequency to a mixing process down the line. First Transmitter Mixer. Something interesting happens here too. This will mix the LMO and and the IF output which is fed by the crystal filter of one of the sidebands. You’ll see how this participates later when we line all these components up to actually generate the desired output frequency in the ham bands. Heterodyne Oscillator. Another interesting block of functionality. Turn the band switch and a wafer switch will switch in different combinations of crystals and inductors to generate these specific frequencies – 12.395, 15.895, 22.895, 29.895, 36.895, 37.395, 37.895,3 and 38.395). At this point, you might want to get out our calculator. If your Heathkit does not transmit on one of the bands. Check here as this oscillator, crystals, and inductance’s are very important to developing the signal on each band. Second Tramsmitter Mixer. Finally, we get the operating frequency. The second mixer mixes the output from the heterodyne oscillator and the first mixer to get the operating frequency. Driver and Final Linear amp. This is the same in all the Heathkit models mentioned in this posting. The driver drives a couple of 6146 tubes to amplify the signal to about 100 Watts. Past this is pi matching circuit that matches the plate impedance to the 50 ohm load of the antenna. The functional blocks we have left out are the VOX, anti-trip circuit, ALC, and other blocks that are not relevant to developing the final RF signal. How all these components work together. You should now know the major building blocks in the transmitter section. Now all you need to do is to string all this together to generate an operating frequency in the ham bands from 80 meters to 10 meters. Speaking into the microphone puts the signal into a speech amplifier and a cathode follower. The amplifier does just that – it amplifies what you say into the mic. The cathode follower serves to link the amplifier with the next stage which is the balanced modulator. At this point we have a good audio signal. Next combine this audio signal, the carrier oscillator and shove these into the balanced modulator. Remember that the carrier oscillator, controlled from the front panel, can be set to LSB or USB. So now we have the carrier frequency plus and minus the audio. The balanced modulator removes the carrier so there are only two frequencies. These are the upper and lower sidebands. But we don’t want both sidebands. Next step is to push this signal through the isolation amplifier and the crystal filter. The filter passes either the LSB or the USB based on the mode swith setting on the front panel. Now we have one of LSB or USB at 3393.6 khz or 3396.5 khz along with all audio frequencies 350 to 2450 Hz. Push this through the IF amp to amplify the signal. We now have only one of the sidebands. Mix the output of the above stage with the LMO in the first transmitter mixer. The LMO generates RF from 5.105Mhz to 5.4 MHz. Mixing the above signal with this LMO range gets you to 12.395Mhz to 38.395 Mhz. Still we don’t have the operating frequency. Mix the output of the Heterodyne Oscillator and the above in the second transmitter mixer. The output of the heterodyne oscillatorwill be one of eight frequencies as selected by the band switch (12.395, 15.895, 22.895, 29.895, 36.895, 37.395, 37.895,3 and 38.395) . Now we have the final operating frequency. Here is how the math works for 14.2 Mhz. Carrier Oscillator (3.395 Mhz) plus speech mixed with LMO of 5.3 Mhz = 8.695. Mix this with heterodyne oscillator of 22.895 Mhz to get 14.2 Mhz. The last step is to push this through the driver and into the linear amp of 2x 6146 valves. The pi network is at the end to match the plate impedance and 50 ohm antenna load. Now you know a strategy for troubleshooting. Before you stick your fingers in any of these radios for trouble shooting when the radio is powered up be aware that the B+ or high voltage inside there is about 800 volts. These are not low voltage rigs like solid state rigs. If you understand the basics of how these Heathkits develop the final operating frequency then you are on the road to doing trouble shooting and signal tracing of the transmit section of the radio. Best if you have a working radio and an oscilloscope. Using the scope, the schematic, and the board layouts you can find test points to watch the signal as it is developed in this chain of components. Think about all the things you can check out. If the radio operates on all bands except one then check the heterodyne oscillators. There is a test point that you can test the oscillator on all bands. The problem might be the wafer switch, the crystals, or maybe someone tried to peak the oscillator and cracked the tuning slug in one of the inductors. Maybe it transmits on no bands. Check the output of the carrier oscillator. Check to ensure that the LMO is working and you see a signal 5.105 Mhz to 5.4 Mhz. If all of the above works then check the signal at the mixers and so on down the line. The idea is basic signal tracing of the audio (speak into the mic or use an audio generator) of the chain of functional block components as it develops the final output RF signal. You need a basic oscilloscope for doing this. It should be noted that this is not what Heath recommended in the manual. They relied on voltage and resistance tests at various points. The Heath folks did not attempt to teach you anything about radio theory or electronics during the construction process. Perhaps that is the reason the signal tracing technique was not used. We recommend functional block testing and signal tracing as a logical way to troubleshoot a defective radio if one understands the design. Lets look at some radios. Ok, enough of this technical stuff, lets look at some of the old Heathkit radios in our collection. The SB-101 was introduced in 1967. This was an upgraded SB-100 which added some improvements anddesignated the SB-101. The two improvements were the addition of a CW filter option that was selectable from the front panel. The second improvement was a change in the control switch permitting the use of the SB-640 remote VFO (LMO). There were some additional minor changes to add a couple of additional spare jacks in the back. The HW-101 was released for Christmas 1970. This HW-101 was a refinement to the HW-100. This radio was available until Winter 1983 and Heathit claimed they sold 30,000 of these kits. The refinements over the HW-100 was improved sensitivity, the dial drive mechanism was improved, and a SSB/CW filter switch was added to the front panel. The HW-101 is the last tube rig that Heatkit ever made the the most popular radio it ever sold. The HW-100 was released in March of 1968. This was the low cost alternative to the SB-101. The HW-101 and SB-101 internals are almost identical except for the VFO. The HW-100 used a low cost solid state VFO. 19 Tubes, and 5 main circuit boards. 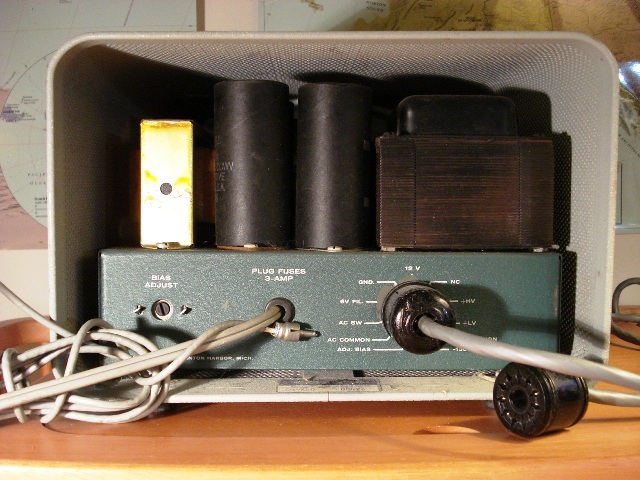 The HP-23 Power Supply and Speaker. Don’t forget that you also need a speaker and the power supply. One option is the HP-23 inside the SB-600 speaker. Here is the Power Supply and speaker combo along with the power cord. This setup will work with all the radios discussed in this posting. So pick up a piece of history on ebay for a few hundred dollars and have some fun. Remember that one one of your fellow hams built this radio. If you are lucky enough to get an original manual you might find some interesting notes and scribblings in there as we did. You can also learn about radio theory and design. If you have a scope you can do some signal tracing and watch the signal through all the stages. Barring a physical problem, all of these radios can be fixed. Need spare parts – that is the best of all – you can buy a complete set of spare parts simply by buying another radio that may be offered on ebay as a tech special or advertised as not working. All four of the radios above share 95% of the same parts. All my radios heathkit radios work. If one were to fail one has the choice to use it as a parts radio to keep the others running or buy another radio on ebay. These are so inexpensive that almost anyone can afford to collect a few Heathkit radios and “Go Vintage”. Get an idea of what it took to build one of these things. If you built one of these things – tell us how long it took and your experience. The HW-100/101 radios have 20 tubes, not 19. The added FET (and bipolar transistor used as a voltage stabilizing zener diode) produce a rather stable “LMO” signal after warm-up, but do require the 6UA6 pentode as a buffer. Thanks for this useful information. It helps us older hams remember the good old days when we built and repaired our own RCVR’s, XMTR’s, and XCVR’s, and helps the newer hams appreciate how far modern day communications equipment has come over the years. I’m hoping this site is still in operation..I have been interested in VHF weak Signal dxing since the early 60’s, back then I was using a Heathkit HX-30 (6 Meter) driving a 250 watt amp. sold it all later and kicked myself every since, lucky me though, I was able recently to find 2 other HX-30’s on ebay at reasonable prices ($125 and $80), one is working fine, the other is a complete parts unit in case I need them, anyway I will be driving another Amp 300 watts this time, also presently have a Heathkit Seneca for 6 and 2 meter CW work, the Seneca is 80 watts but I will scale it down to drive a 600 watt Amp on 2 meters this fall during the meteor shower.also my SWR/Power meters are Heathkit. 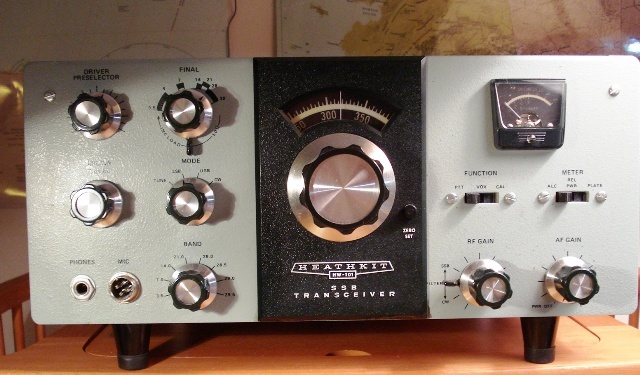 if anyone has a Heathkit HA-20 6 Meter Amp they will sell me please let me know. Can a SSB transceiver pickup the old timers AM nets and round tables? Was just surfing and caught this site. Way back when I was first licensed in 1978 and was a novice a HAM “friend” sold me a nice Heathkit and slung up a dipole for me. So I eagerly tuned up and started pounding out my best 15 wpm Morse. A very nice gentleman in Texas was patiently helping me with my first QSO when he suddenly sent, “Sweetheart what class of license are you?”. I sent back novice to which he sent back, “Well darling you are in the extra portion of the band.” I never sent Morse so fast in my life and cleared! It turned out that “Snowy” as we named her was a drifter. Some other older HAMs set it up then monitored it as it slowly drifted off to where ever she wanted to. I sold ol’ Snowy soon after and with full disclosure. My first contact will stick in my mind forever! There’s no such thing as a bad Heathkit radio just bad builders of Heathkits. If you want I have an SB-100 HeatKit and if you still looking for one. Have a wierd problem with a hw 101 – have restored it, replaced all resistors as per hw101 service bullitens,and lots of resistors that have gone ‘high in value’ even fitted lcd frequency readout, however tx frequency is about 1200 khz high on tx, tried everything – reluctant to fiddle with alighnment, any ideas?? There are a couple of tubes that seem to be hard to get for the HW-101 right now, the 6HS6 and the 6GW8 in particular. Thought on this, any ideas on substitutions? I met the people that run this company in person. Nice guys. They test all the tubes before they sell them. If the tube does not work send it back and they will send you another. Tell them what you need. If they don’t have it they will try to find one for you. Alternatively, a “Tech Special” (not working) Heathkit HW/SB etc is usually available on e-bay for cheap. Think of it as a parts cabinet for your working Heathkits. Might come in handy when you need a special part. I beleive you can substitute an ECL86 for the 6GW8 ? I am looking at the Heathkits on ebay. None of them seem to come with the original microphone. Any ideas on what is suitable to use? I talked to an engineer at Heil and he said : The only high impedance microphone we offer is our Goldline Vintage. It is a single element meant to be used on older boat anchors and high impedance units. It would work but you will probably have to drive the hell out of the mic gain to hear anything and then you will introduce more distortion than signal to noise ratio and it probably wont work either way. Probably one of the most popular microphones to use on vintage high Z (impedence) radios like the Heath, Kenwood, Drake, and others is the Astatic D-104. Typical price would be $65-$90 depending on condition for a D-104. HELLO EVERY BODY — There are HEATHKIT detractors, every where — sure, Liberty for All — BUT — the ones who can speak, are those who enjoyed the whole thing. Every child in his yard. Other opinions comes from other games. I had a SB 102 thirty years ago, and it was a nice and super tech experiencie. Today watching pictures in the web, and checking same model and prices, I am asking why I sold the whole station LU 3 AJZ !!!! No reason, I had a tryp to ENGLAND, at last moment aborted !!! — BUT — HOO HOO — Today, I bought a hw 101 like new, almost without use !!!!! HO YEAH !!! AND PAYED 5OO US DOLLARS —! Noooo, noooo, noooo problem! — its all fine LADS —! It is the joy of PLAY, stupid!, and too, recovered my ham radio licence —- Reegards from ARGENTINA, from PAUL AGUILERA. Can you tell me where i can obtain a set of finals for a heathkit 100,also the coast. You can get the 1 driver tube and 2 finals at ‘RF Parts” or ebay. For the pair of 6146’s I think I paid about $30 at RF Parts. Never bought a driver tube. On ebay, they go for $8-$50 for the pair. The price of the HW101 when first released was $249.95. Heath bragged that they had improved the HW100 and made it a nickel cheaper! It went up to $400 in the final years of production. Many HW100’s had various types of third party vernier dials attached to fix its’ glaring weakness, which was mostly solved in the HW101. I owned an SB102, I purchased it in the fall of 1970 and owned it till 1982 when I replaced it with a Kenwood TS820. IIRC the SB102 had a bullet proof front end that wouldn’t completely cave in when a strong station came on less than 100khz away. Todays latest rigs can do better, but the ‘102 was among the best in it’s day. (Might have been better than the TS820 in fact). The only problem I had was with the smeter and carrier null pots going bad. I replaced them with el-cheapo units from ratshack, which worked better and lasted as long as I owned the rig. The problem I have with the SB101 is slippage of the VFO dial. I have not taken it apart but it looks like its a friction drive – and it slips. If I remember correctly, the HW100 and HW101 have gears that drive the capacitor tuning. LMO. Any ideas on where I can obtain this information? Very interesting to read this all. End 1960’s I was the writer of articles in our Dutch Ham Magazine Electron about Heathkit stuff. If I read the story above and see the photo’s I get tears in my eyes :-). Nice time it was when soldering, fitting etc. and at the end have a nice signal and good QSO’s all over the globe. I came to ham radio after the tube era and missed all this – so I bought all these radios used. Some of the Heathkits I bought came with orginal manuals marked up by the builder with notes and other other observations and insights during the build. If you have any old articles that you wrote, pictures, stories about how you built these radios, I can publish them on this site if you would like to share this with other hams out here that can appreciate these vintage radios and the culture of hams that built them. Sorry, no I haven’t the articles any more. Be aware the articlesy where written in the Dutch language. I am Mario of http://www.cb-museum.de German CB-radio-museum. I have a Browning Raven and a Heathkit GW 30 doubly in my collection and would like these to sell. What are these devices today in the USA value? Do you know a collecting tank these devices search? el trabajo desarrollado en este capitulo es muy interesante, te felicito por el entusiasmo que tienes por estos equipos Heatkits, tengo uno en mi poder y no he podido dejarlo funcionando, al parecer tienes muchos problemas, no esta intrusiado o trajinado pero pienso que cumpli una gran esta la que no puedo solucionar. te agradecerè si puedo contar con un circuito. I posted a link to the Heathkit HW-101 manual in the resources section. 245 pages – have a good read. Where can i ge a hw 101 manuel to download? Good luck Mark. If you belong to a local club you might want to do a demo or presentation to them on these older radios. Some hams are “appliance operators” and perpahs never seen the inside of a radio that was a radio before microprocessors, chips, surface mount, and multi-layer circuit boards. So, take your Heatkits to a club meeting, do a presentation and show them what a radio from the 1960’s-70’s look like – glowing tubes and all – show them how to “tune up” a tube radio. Maybe you can generate some interest at your local club for members to “Go Vintage” and maybe add a Heathkit to thier radio collection – if not for nostalgia then for those who want to learn about electronics – these radios are a great base for this – easy to understand and play with. Great job on the web page! I am a big fan of the vintage Heathkit stuff. I have a HW-101 and just aquired the HW-100, as well I have three HW-30. Looking to take the test after the local club classes in January. Regardless it’s cool to hook these up and look for signals.